Anyone who commutes in the east end has probably seen him at least once: a cyclist dressed head to toe in white, a neon orange safety vest over top and bright ankle straps around his pant cuffs, slowly riding a bike emblazoned with reflective tape and festooned with more flashing lights than Honest Ed’s. Pretty much every cyclist in the area that I’ve spoken to knows about him, and all marvel at the magnificent spectacle as he passes by. He rides at a relaxed pace, yet no one ever honks, no one ever asks him to get out of the way, and everyone’s day is brightened if only for a few seconds. After years of fleeting glimpses, always headed in the opposite direction, on the other side of the Viaduct, or visible only as a strobing blizzard of light in the distance, I finally found myself coming up behind him on a quiet street in Rosedale. In our brief conversation, I learned that he cycles downtown every day from Markham & Lawrence. Even out there, car drivers have no trouble seeing him and give him a wide berth. My commute is often the best part of my day, but I don’t know that I’d have the gumption to ride that far every day, especially through the unfriendly streets of Scarborough. 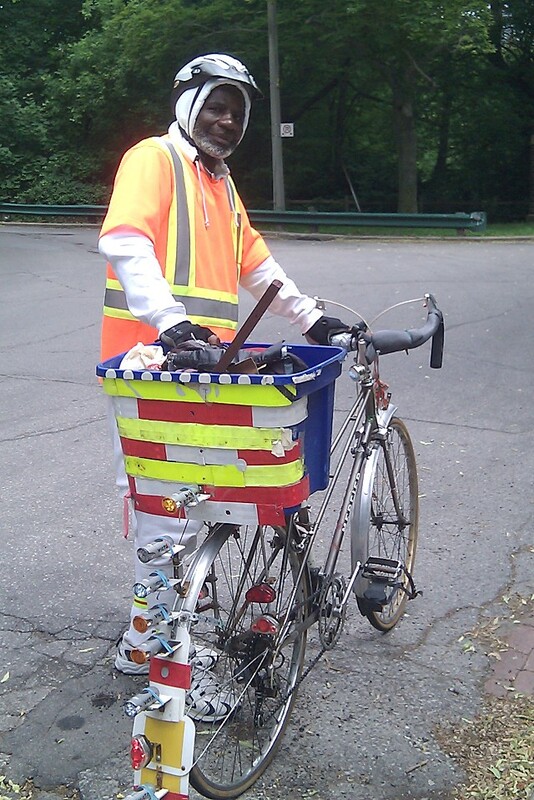 In keeping with his over-the-top bike, he is by far the most cheerful person I’ve ever met on a Monday morning. I felt like a giddy schoolgirl who’d just bumped into Shaun Cassidy at the corner store when I sheepishly asked if I could take his picture. Victor, you’re an inspiration.